On other news, here's something for FMA fans. 1/6 PVC prepaint figure releasing in Feburary next year. Not quite figurines but these are sculpted objects based on anime. So I guess it's appropriate. 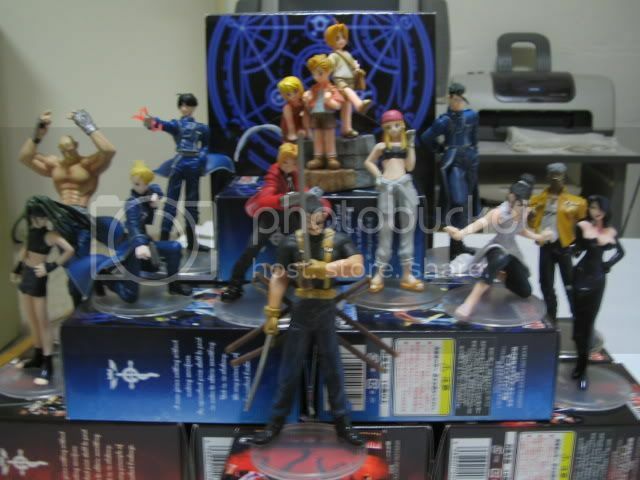 can anyone list a few decent sites for me, I wan2 start collecting anime figurines but not sure where to start. Also I'm in England so anyone know of any english stores or ones that deliver to the uk?? I haven't bought from them before though. I get them from my local shop. HobbyLink Japan is, I thought from personal experience, very good, and its prices, excluding shipping costs, were generally competitive. As long as the item is in stock, my orders had been quick to leave their system. Once out, though, delivery and arrival times then depend on what you chose for shipping, customs, and such; SAL is cheaper but (normally) slower than EMS. Local shops - even with their markups - would be better, IMHO, as long as they actually have what you want in stock. Street Fighter poseable action figures. What about the Saint seiya myth cloths? These little toys are very well liked by all saint seiya fans world wide! and they are very cool too since you can take the armor on and off! Cheap? You want it cheap? The baes of the two figures, Mylene Jenius and Lynn Minmay, hook together to form something of a diorama. I actually have them, but everything is still sealed inside the boxes. No photos, then. I have been trying to collect resin statues so far, but its hard to find some for good prices. I have this very detailed Neon genesis statue of Rei I bought on ebay. Combat-san by Hoi Hoi-san! I want it! Get a Hazuki figurine with the Tsukuyomi DVD! This is off the topic but do anyone know how your suppose to take care of statues? Do you leave them boxes or what? If you leave them to much in the light does the color start to fade away on the statue? Just wondering cause I dont want to do something dumb and ruin my collection. Ok back to the topic I think the thing I want to get the most right now are escaflowne statue of Hitomi, cowboy bebop statue of faye, or Cloud riding the daytona motorcycle. Not sure if you guys consider that an anime though. How festive! Combining two of the best things in the world, Rei and Christmas. Last edited by LK_LoA; 2004-11-11 at 23:57.
is there a reliable popular site that sells figurines?